1990 Jackson Mini Mal 7ft 10"
Foam blank, triple 1/8'' redwood stringers, fibreglassed, foam spray, pinlines, one 12'' finbox, two 7'' fin boxes, two legrope plugs..
allowing all combinations of fin set up. One 7 1/2'' x 5'' base single fin and Two 3 3/4'' x 3'' base side fins. Note fin cam at the centre fin's tab. Large Jackson script Grey down stringer at s.spot, Image below. 100% Waterproof Red on tail. Large Jackson Surfboards round at s. spot,Image right. 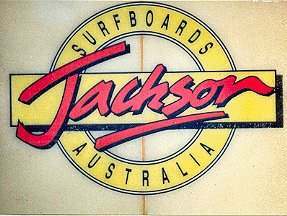 Small Jackson Surfboards round at rear. All Red/Yellow/Black. Custom order based on reworked San Juan Malibu #32. Glassed heavy, multi stringers, fin boxes to allow all fin combinations, vee in tail to ensure rail boxes tip out. 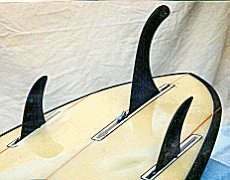 Fitted and ridden with single fins, twin fins, several tri-fin combinations and several thruster fin combinations. 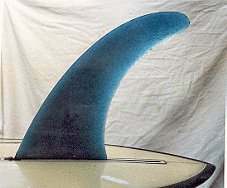 The board was ridden with all fin combinations : several single fins, twin fins, several tri-fin combinations and several thruster fin combinations. Two 3 3/4'' x 3'' base side fins.